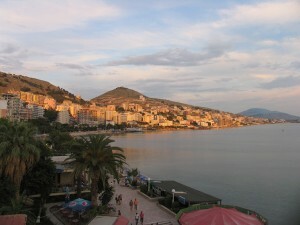 Seaside Sarande. Photo by Esther Hecht. The most mysterious country in Europe—which celebrates its 100th anniversary of independence this year—is a place of dramatic extremes. Cut off from the Western world for decades under the rule of dictator Enver Hoxha, Albania is rushing toward openness and modernity. of tempting beaches. Villages of stone cling to the mountain slopes as if frozen in time, but in coastal cities, apartment buildings and hotels are rising at a frenetic pace to meet the demand of sun-hungry Europeans. About 60 percent of the population is Muslim, the result of more than four centuries of Ottoman occupation. Yet after half a century of state-enforced atheism, the population is largely secular and it is considered bad form to ask what a person’s religion is. Though Jews have lived in Albania for centuries, there are few physical remains of their presence. But there is a very important Jewish reason to visit: Because of besa, the Albanians’ code of honor and hospitality, both Muslims and Christians risked their lives during World War II to shelter and save the local Jewish population as well as many hundreds of refugees from other European countries. Jews throughout the Balkans were linked by close family and commercial ties. Those in Albania were especially close to Jews in Corfu, Ioannina, Arta and other Greek cities. According to Albanian historian Apostol Kotani, Jews may have arrived in Albania as early as 70 C.E. He points to sources that describe Roman ships with Jewish captives, en route to Rome, that washed up on the country’s southern shores. The captives’ descendents may have built the synagogue in the southern port city of Sarande in the fifth century C.E. Little is known from then until 1281, when a small group of Jewish merchants who traded in salt and sheepskins lived farther north in the port city of Durres, which was an important link in the trade route between Rome and Istanbul. In the 15th and 16th centuries, the Jewish community constituted one-third of the inhabitants of Vlore, then the main administrative and military city. Jews had come to Vlore from France, Corfu, Spain and Naples. They were exporters of textiles and leather goods and also traded in agricultural land. 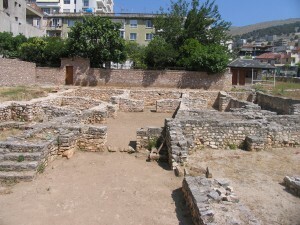 Ruins of the synagogue in Sarande. Photo by Esther Hecht. In the 17th century, Vlore declined and Berat grew in importance. Followers of Shabbetai Zevi, the false messiah, settled there. There is little information about Jews in Albania from 1700 to about 1860. A few converted to Islam or Christianity. But in the 19th century Jews came from several Greek cities, especially Ioannina, and settled in a number of towns, including Gjirokaster, Delvine, Vlore, Berat, Elbasan, Korce, Shkoder and Kruje. In 1912, Jews participated in the struggle for independence. After 1928, when Albania became a monarchy, many Jews moved there from Greece, again especially from Ioannina. They included pharmacists, doctors and merchants. The 1930 census shows 204 Jews. In 1935, Leo Elton, a British journalist, visited Albania and reported to Judah Magnes, first president of the Hebrew University of Jerusalem, that Albania was an ideal refuge for the Jews and might eventually become a Jewish national home. After Hitler came to power, Jews from Germany, Austria, Czechoslovakia and Poland poured into Albania. Thus began the remarkable rescue. Italy occupied Albania on April 7, 1939, and then conquered Yugoslavia, annexing large parts of Kosovo, including Prishtina. In 1942, Jews from Prishtina moved to Berat; others moved to Shkoder, Tirana and Elbasan. Some joined the partisans. When the Germans occupied Albania in summer 1943, the situation worsened for the Jews, especially the refugees. Many were hidden by Albanians. When in spring 1944 the Germans demanded that the Albanian rulers hand over lists of Jews, they refused, promising the Jews protection. Only one family, the Arditis, was found and deported. By January 2011, 69 Albanians had been recognized as Righteous Gentiles by Yad Vashem in Jerusalem. After the war, there were some 180 Jews in Albania. Some left in the late 1980s, and in 1991, when the borders were opened, most left for Israel. Jacob Sallomon was born in 1943 in Vlore, where his father and grandfather were cloth merchants. Despite the ban on religion, he remembers celebrating all the holidays. Services were held in the home of his great-aunt. When Sallomon was in fifth grade, he traveled to another city with two other boys to be circumcised. 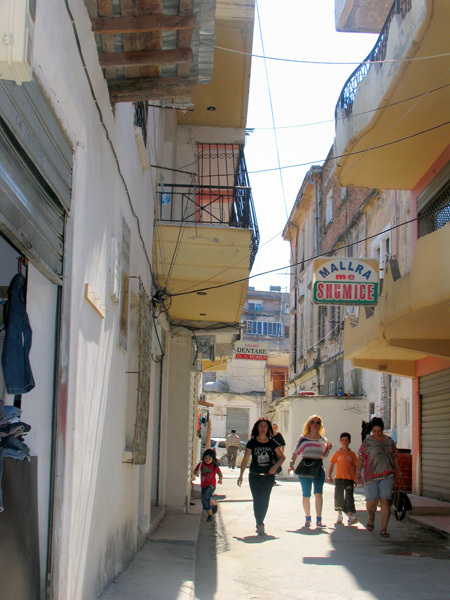 Vlore’s Jews’ Street. Photo by Esther Hecht. He moved to Israel in 1991. His family was one of a dozen sent south to Beersheba; the others were sent to Karmiel in the north. Despite the distance, the two groups remain close. Sallomon, who often visits his native country, believes that only a handful of Jews remained in Albania, a country of 3 million, but Jews have come from elsewhere, including Kosovo. A community leader in Tirana estimates that there are 40 to 50 Albanian Jews, including about 20 children, mostly in the capital. Most are engaged in business, and they all know each other and celebrate holidays together, but have no Jewish school or cemetery. In 2010, Chabad opened Hechal Shlomo Synagogue (011-355-4-225-3470) in Tirana, appointing Rabbi Yoel Kaplan—based in Thessaloniki, in northern Greece—the “chief rabbi” of Albania. Kaplan calculates that Albania has 200 Jews and several hundred more with Jewish connections. He conducts Shabbat services when in Tirana, usually without a minyan. Kaplan plans to hold High Holiday services in the synagogue, at 17/1 Ismail Qemali Street, opposite the former residence of Hoxha. He also hopes to obtain a plot for a Jewish cemetery. Driving in Albania is an extreme sport. Cars share the roads with tractors, carts drawn by horses or donkeys and the occasional herd of cows, sheep or goats, not to mention stray mules. But the scenery ranges from the merely pretty to the spectacular. The road from Sarande to Vlore, for example, plays hide and seek with the sea as it winds over mountains and through valleys. Amid this beauty, however, the 750,000 concrete antitank bunkers built by Hoxha are everywhere like malignant mushrooms, reminders of darker years. Rapidly growing Sarande, the southernmost city, surrounds a serene bay on the Ionian Sea. In the city center, at the intersection of Abedin Dino and Vangjel Pandi, a large fifth-century C.E. synagogue that was later turned into a church has been excavated. According to Israeli archaeologists, the synagogue’s location in the heart of the ancient city means that the Jewish community was large and well-to-do. The mosaic floors in the central basilica and in a side room contain such symbols as a menora and an image resembling the Holy Ark. The floors are kept covered for protection; a photograph can be seen in the Archaeological Museum a block away. For a panoramic view of Sarande, visit Lekures Castle, on the way to Butrint. Lying 10 miles south on a good road, Butrint is one of Albania’s gems, a Unesco World Heritage Site and a national park (www.butrint.org). This large archaeological site is in a forested area on a lagoon. It has finds from its fourth-century B.C.E. beginnings as a sanctuary dedicated to Asclepius, the god of healing, through the 19th century C.E. The coastal road north from Sarande to Vlore is lined with cedars and pine trees. Beehives dot the land between the trees, and at roadside stands vendors sell honey in jars of every size. Vlore, a large city with miles of sandy beaches, was the center of Jewish life in Albania in modern times, though little remains to be seen. In 1912, Albania declared its independence here. If entering the city from the south, on Uji i Ftohte, bear right (east) at the Skela roundabout to Vlore Skela Boulevard to reach an area called Orizi. Here, the Jewish, Christian and Muslim cemeteries once stood side by side. All have been moved outside the city to an area called Babitsa. Souvenirs for sale in Kruge. Photo by Esther Hecht. Just past Flag Square—a beautiful park with an independence monument and the tomb of Ismail Qemali, founder of modern Albania—is the ProCredit Bank. The city’s largest synagogue once stood here between two houses. Return to Flag Square. Near here were two synagogues, one destroyed by an earthquake and the other by fire. Proceed to the famous 16th-century Mosque of Murad, made of carved stone. Next to it is a handsome, three-story gray stucco building with arched windows and a tile roof that is still owned by Jews. Built in 1928, it served as a synagogue and then as a public library; now it is a private school, Shkolla Nr. 1. Finally, return to the Skela roundabout and drive north along the beach to an area called Triport. Here it is said that Jews expelled from Spain in 1492 landed in Albania. From Vlore, continue north to Fier and then east to Berat. Its old town, on the forested slopes of the Tomorr Mountains overlooking the Osum River, is a World Heritage Site known as “the city of a thousand windows.” Its white houses with windows framed in dark wood seem to be piled one above the other. 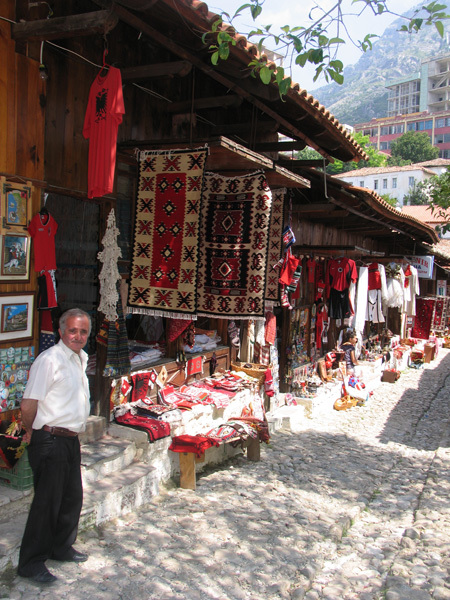 During the Ottoman period, Berat was a major center of woodcarving. Climb the steep hill to the castle. On the way, stop at the Ethnographic Museum, in what was once the home of a landowner. Director Ajet Nallbani’s father, a blacksmith named Hysenj, hid a Jewish man during World War II. Albanian castles were fortified areas where a town’s population lived. Berat’s castle contains St. Mary’s Sleep Church, which is now a museum dedicated to the excellent 16th-century icon painter Onufri. Like Vlore, Berat has a Jews’ street in the center, called Rruga Hebrejt, perpendicular to Antipatrea. From Berat, continue north by way of Lushinje to Elbasan, which has an interesting walled old town that used to boast a synagogue. The road from Elbasan to Tirana is breathtaking, in mountains as beautiful as the Alps. Tirana is a sprawling, lively and colorful city with more than 600,000 inhabitants. On hot days, well-heeled residents head for shady outdoor cafés on the city’s outskirts. Apart from the synagogue, almost the only reminder of Jewish life is a plaque in the National Historic Museum listing Albanian families that hid Jews during World War II. The Albania-Israel Friendship Society, on the second floor of the Livia Hotel in the city center, provides information about Israel and promotes relations between the two countries. Its director, Petrit Zorba, is a mine of information (355-68-215-1684; aspetalb@yahoo.com). The home of Skanderbeg, the Christian national hero who led the struggle against the Ottoman invaders in the 15th century, is in the hillside town of Kruje, northeast of Tirana. The Skanderbeg Museum there is filled with murals, sculpture and other artifacts honoring his memory. Kruje also has the best selection of souvenirs, including kilim rugs, embroidered tablecloths and fringed scarves. In Ismail Kadare’s first novel, The General of the Dead Army (Arcade), an Italian general and a priest are sent to Albania after World War II to collect the bones of their countrymen and bring them home for burial. His lyrical Chronicle in Stone (Arcade), set in Kadare’s native town of Gjirokaster, portrays the absurdity and terror of Albanian history as seen through a child’s eyes. It won the Man Booker prize in 2005. Susana Fortes’s novel The Albanian Affairs (McPherson; translated from the Spanish) uses forbidden love to explore the theme of memory under the Hoxha regime. In Rescue in Albania: One Hundred Percent of Jews in Albania Rescued from Holocaust (Brunswick Press), Harvey Sarner writes the history of Jews in Albania, from the Roman era until 1991. Besa: Muslims Who Saved Jews in World War II by Norman H. Gershman (Syracuse University Press) contains photographs of the rescuers and brief anecdotes about each. The portraits were exhibited in Yad Vashem in Jerusalem and in the United Nations’s headquarters in New York. Albanian historian Apostol Kotani is seeking funding to print an updated English version of his Jews of Albania. In Joshua Marston’s 2011 film The Forgiveness of Blood, two young siblings in Albania become involved in a blood feud after their father is accused of murder. Shabbetai Zevi, the 17th-century mystic, was exiled by the Ottoman sultan to Ulcinj (Montenegro), north of Albania. In 1676, Zevi wrote to the head of the community in Berat asking that High Holiday prayer books be sent to him. The scholar Gershom Sholem wrote that Zevi died and was buried in Ulcinj. But Itzhak Ben Zvi, Israel’s first president, believed that Zevi died in Berat, and on the periphery of the town there is a place called Varri i Çifutit (Tomb of the Jew). Kotani and Albanian archaeologist Mizapi Korkoti argue that Zevi died in Fterrë, a village near Sarande, and was buried there on a hill called Galilee. Albania has 300 sunny days a year and is one of the most affordable destinations in Europe. Sarande is just half an hour from Corfu by ferry. Tirana can be reached by air via Vienna or Istanbul. If you plan to rent a car, consider taking it one way from Sarande or Tirana and dropping it off in the other city. Be prepared to pay cash nearly everywhere, even for car rental. Be prepared, too, for shops and businesses that are lit only by natural light during the day. The National Tourist Organization of Albania provides a good overview of most points of interest on their Web site, www.albaniantourism.com (or call 355-4-273-778). Tirana’s Livia Hotel (www.liviahoteltirana.com), off Skanderbeg Square in the city center and within walking distance of the synagogue, is very decent and affordable. The same can be said for the seaside Hotel Porto Eda in Sarande (www.portoeda.com) and the Ambassador Hotel in Vlore (355-33-229-385; ambassadorivl@yahoo.com). For car rental and trip planning help, contact Fatos Demiri at Terini Travel Agency (www.terini-travel.com). While there are no kosher restaurants in Albania, fresh produce and fish abound, as do pasta and good thin-crust pizza. In Gjirokaster, try a single-portion traditional “pizza” called kulaj, made with salty white cheese, olive oil and oregano. Tirana also has much tonier dining options and accommodations, such as the hotel and restaurant Bujtina e Gjelit (www.bujtinaegjelit.com). On the way from Sarande to Vlore, stop at a roadside café in Borsh called Ujvara (waterfalls), built over a waterfall that runs through its garden. In Vlore, drive up to the hilltop Kuz Baba, a café next to the center of the Bektashi order of Sufi Muslims, for a panoramic view of the city. And if you see a doll or a teddy bear affixed to the top of a house under construction, or garlic hanging above the entrance to a business, know that it is there to ward off the evil eye in this country where it once took much more than dolls and garlic to create a safe haven for Jews. Esther Hecht blogs about her travels at estherhecht.wordpress.com. Thank you for this article! Do you know how one can see the ancient Synagogue in Sarande? We would like to take a day trip during a short visit to Corfu but don’t know what we can see of relevance to Jewish history on a day trip and whether general tours provided incorporate anything of Jewish interest. I wish there were trips for Jewish tourists who believe we have a pleasant duty to visit countries that acted righteously and saved Jews’ lives in the darkest of times. I would so love to meet descendents of families who saved Jews. We have visited Bulgaria which saved 90% of its Jews. There are a few monuments from Israel and the Jews thanking Bulgaria. Jews were fully integrated in Bulgarian society. In one shul, we saw plaques in memory of their mmembers who died for the moledet (homeland, ie Bulgaria). There was no concept of racism. Even the Bulgarian Church does not have a history of anti-semitism. Bulgarians saw Bulgarian Jews as fellow Bulgarians. My grandparents lived in Bulgaria for over 10 years in the early 20th century and my Grandma said they were a nice lot (unlike her previous experiences in Ukraine ). Almost all of Bulgaria’s Jews are now in Israel. Up to 3000 remain, mainly in Sofia. Personally, I keep away from anywhere money is being made from the Holocaust. That is one of the ways I feel I can show my respect for the millions murdered. It is really moving this article. I always thought that language bridge nations closer. Albania- Israel relationship must not be stopped at the WWII: why not bringing Hebrew language in Albania? This is my dream: since 2015 I travel every year to Israel, main location Tel Aviv University. I am studying Modern Hebrew, and would love to contribute and bring it in Albania. Who knows, but I intend to develop this way and translate directly Israeli literature from Modern Hebrew to Albanian. This winter I am flying again to attend the Winter Ulpan, Bet/Gimmel level. Hello! I’m trying to figure out a little bit more about the pre-WWI population in Albania and why it was so small. You said that in the 15th and 16th century one-third of population of Vlore was Jewish (which according to my research would be somewhere around 3000 Jews) but elsewhere I’ve read the Jewish population of the city was somewhere around 600. I know this article is a couple of years old but I was wondering if you had any of your sources available still? Any information would be appreciated! Thanks a lot. Todah Rabah :-* for that brilliant Article. I have a personal Project and currently i´m figuring out, how i can start. Rebuilding of the Synagoge in Saranda. It would be for the Tourist Situation positive too. And thanks for this great Webpage!! !